Bronwen and Rachael are best friends who were both diagnosed with breast cancer within the same year. They are passionate about fundraising for Breast Cancer Now along-side their friends Sophie and Angie-May, now they would like to tell you why. Rachael was diagnosed at 41 with grade 2 multi focal invasive lobular cancer in August 2012 and underwent a mastectomy, chemotherapy and radiotherapy. In September 2014 Rachael had a prophylactic mastectomy with double reconstructive surgery. Bronwen was diagnosed at 40 with grade 2 invasive ductal cancer and extensive high grade DCSIS in July 2013. She had a mastectomy with immediate reconstructive surgery, chemotherapy and Herceptin. Both are now on a 10 year course of hormone therapy. Bronwen: ‘When Rachael was diagnosed with breast cancer I was devastated. I remember thinking that it couldn’t be possible as people our age just didn’t get breast cancer. I know now I was wrong. Rachael was such an inspiration to me throughout her treatment. She bore every indignity and side effect with such grace and stoicism that even though I went with her to treatment I had no idea how tough it really is, until I went through it myself. Rachael kept life as normal as possible for her kids and her family and has come out the other side braver and stronger than before. Cancer changes you physically (weight gain; bloating; hair loss; mastectomies) but also mentally and the worry about it coming back. Although as time goes by these worries lessen, which is why we found it immensely re-assuring to visit the Breast Cancer Now Research Centre and talk to scientists who spend their working lives trying to eradicate the disease. We became involved with the charity during our treatment as we really wanted to do something positive. 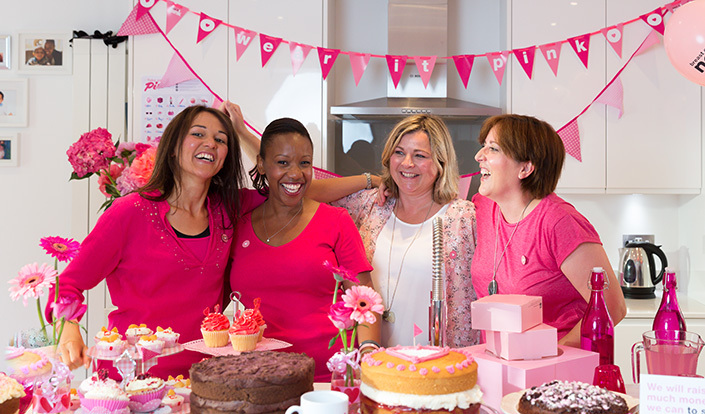 We started our annual bake off and we hope to raise even more money this year for wear it pink. We hope that we have beaten breast cancer and seen the back of it but until Breast Cancer Now achieve their goal of ensuring that no more women die of breast cancer we will continue to campaign to raise awareness and raise money to fund their much needed research. We urge you to do the same. Whether you’re a first timer or a seasoned wear it pinker, get involved with wear it pink on Friday 21 October and sign up now for your free fundraising pack.